For Teresa Gabriele the upcoming women's basketball second-chance tournament could be her final shot at the Olympics. The 32-year-old has been trying to qualify for the Summer Games for more than a decade and she admits her retirement from basketball could be just around the corner. When Gabriele was 20 and one of the youngest members of the Canadian women's national team that qualified for the Olympics in Sydney, Australia she naively thought that playing on the biggest stage was something that would come almost automatically every four years. Now 12 years removed from Sydney and an experienced veteran who has played more than 170 games and 15 years for Canada she understands what a privilege it is to play at the Olympics. 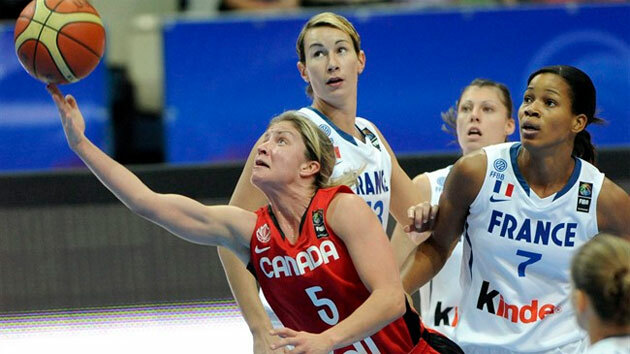 She was a part of the Canadian teams that failed to qualify for Athens in 2004 and Beijing in 2008. And as the Canadian women head to Ankara, Turkey with a chance to qualify for London at the second-chance tournament she's trying to preach to her younger less experienced teammates that it's important not to take any part of these experiences for granted. "A lot of these players are in their first couple of years with the national team and who knows how many more opportunities they're going to get to represent their country and or go to an Olympics," said Gabriele, a point guard from Mission, B.C. "Who knows when something may happen in your life, a career ending injury, where you're not playing for your country anymore. It's important they know to kind of seize these opportunities when they come around and make the most of them." It's not the first time Canada has attempted to qualify for London. They failed to earn a spot in the Olympics through the FIBA Americas championship in September and have been preparing for their second and final chance at qualifying ever since. They'll need to finish in the top-five of the tournament in Turkey that goes from June 25th-July 1st. "I think everyone on the team wants to know if we're going to the Olympics or not, we're just excited to get the tournament going and get playing," Gabriele said. Gabriele is also more confident in this group of players than she has been in past Canadian teams that have attempted to qualify for the Olympics. She says after 2000 in Sydney many of the older players moved on from basketball and for a few years following they were carrying a team mostly filled with inexperienced university athletes. Now most of the team has experience playing overseas and on an international stage and Gabriele believes they're ready to compete with the best in the world. "We feel that there are five berths and there is no reason why we can't get one of them. "We're not going to this tournament just happy to be there, we really feel like we deserve to be there and we are in contention for one of those five berths. Definitely we're as ready with this program as we've ever been."